Note: be sure to scroll down to the comments section for a reader's mention of a town in Germany, Emlichheim, where there are Welink family members, related to the Schoemaker family. 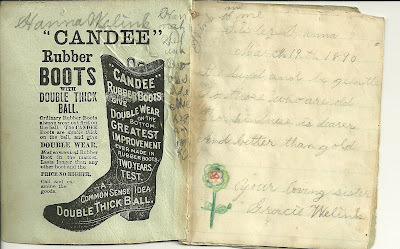 Wonderful little homemade autograph book prepared in 1890 by or for Hanna Welink, or Johanna Welink as she was more formally known, of Newaygo County, Michigan. Notice the stitching along the spine. 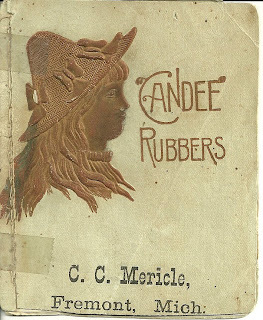 The covers were made from a card advertising Candee Rubbers; the front features the embossed head of a girl in sunhat. 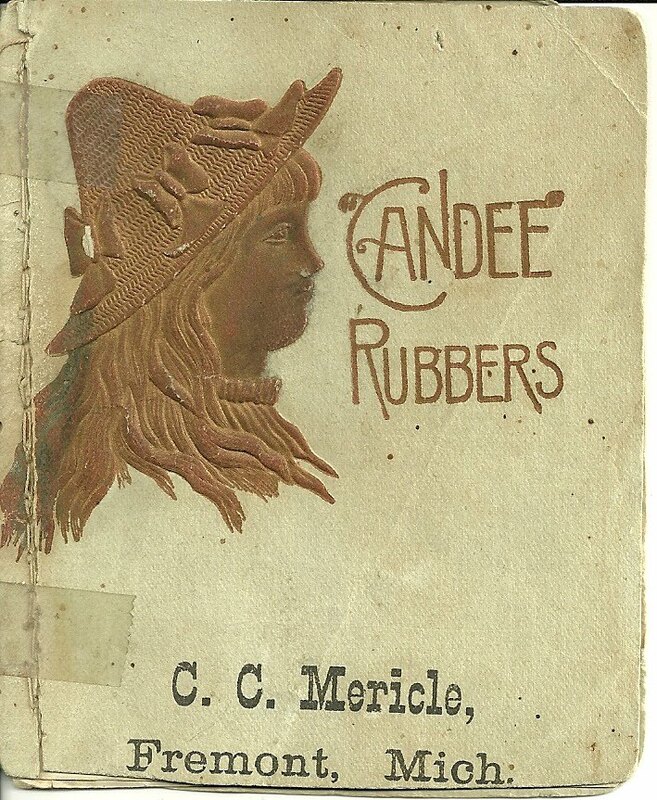 The local retailer for Candee Rubbers in Fremont, Michigan was C. C. Mericle. The interior pages are made from lined paper cut to size. The first autographed page was made by Hanna's sister Grace Welink, who later married John Myron Beem, Judge of Probate of Newaygo County as of 1921. Beem's first wife died in the winter of 1918, one wonders of the Spanish flu; he married Grace in 1922. 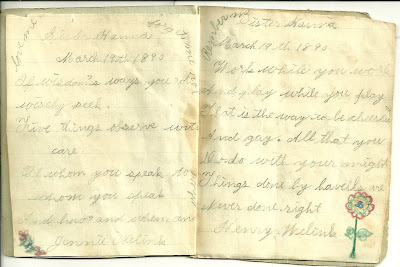 Grace signed the page "Gracie Welink" and dated it March 19, 1890. 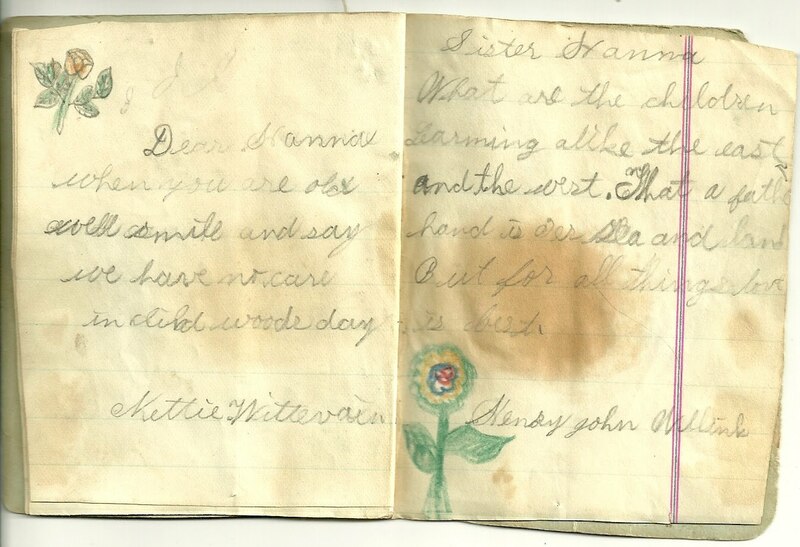 The next two pages are signed by Hanna's sister Jennie Welink and brother Henry Welink. Henry signed a later page as well, in which he called himself Henry John Welink. 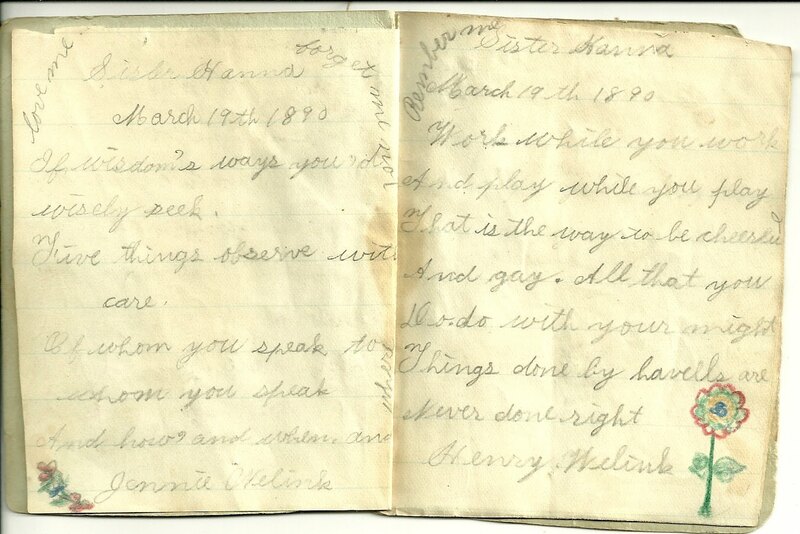 They both dated their pages as March 19, 1890. Jennie Welink was born in Michigan in December of 1886; I don't know if she married or not. The last Census I find for her name as Jennie Welink is 1910, but I need to search variant spellings. 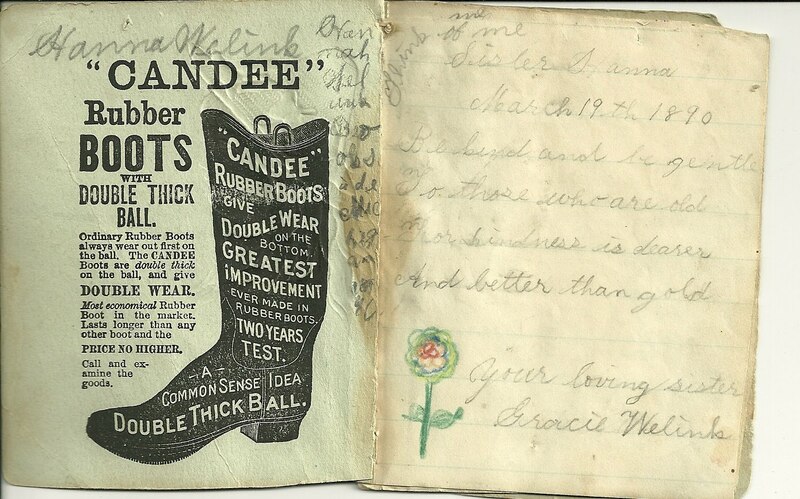 Interestingly, I found a reference online to Jennie's remembrance book given to her by her mother in 1896. Henry John Welink was born in Germany in 1882; I don't know if he married and had children or not, but he was living with his father in the 1920 and 1930 Censuses. 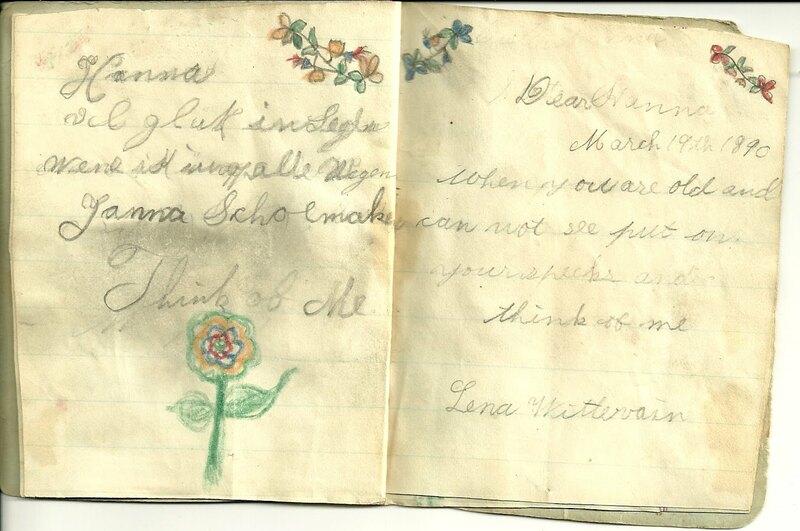 The next two pages are signed by Hanna's friends Janna Schoemaker and Lena Wittevain. 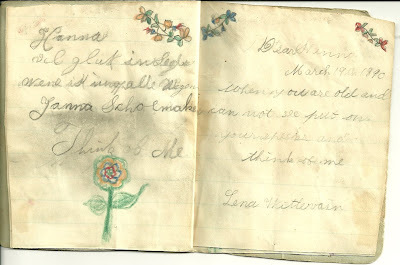 Lena dated hers March 19, 1890. I couldn't find any references for either of these names. It's possible that "Janna" is incorrect. Also, it's possible that the Wittevain name is a variant spelling of Wittevein or Witteveen. If you have any information on the identity of either of these two friends of Hanna, I would love to hear from you. 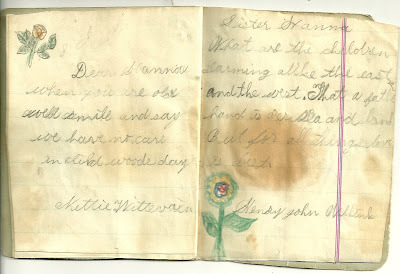 The next two pages are signed by Nettie Wittevain and Hanna's brother Henry John Welink. Again, I couldn't find any information on the Wittevain name. The page signed by Henry John Welink is the one I referenced above. 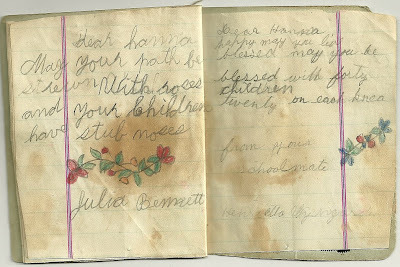 The next two pages are signed by Julia Bennett and Henrietta, whose last name I can't quite decipher, though she identified herself as a schoolmate of Hanna; it's possible Wynegarden. 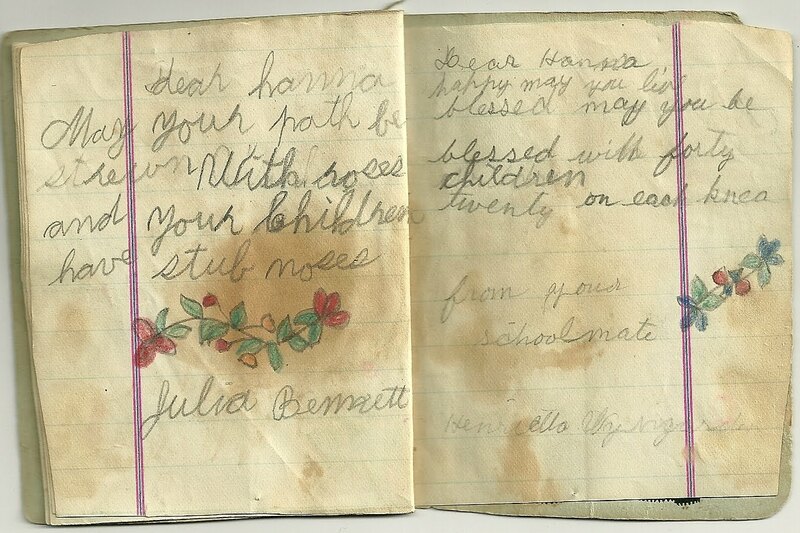 Julia may be the daughter of John and Mary Bennett, who was born in October of 1881 in Michigan. 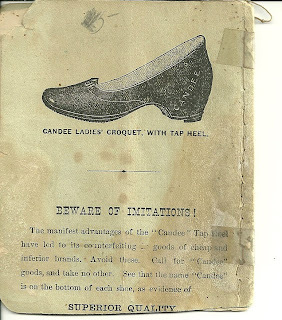 The last inside page was signed by Emily E. Miller and dated Wednesday, May 23, 1890, Fremont, Michigan. 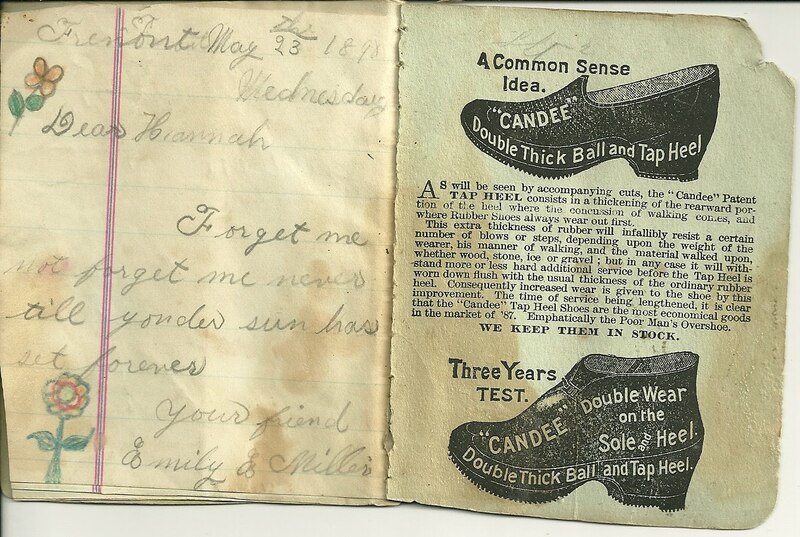 I found an Emily Miller, born in 1881, the daughter of Adam and Barbara, but they were living in Superior, Michigan. Whether this is the same Emily who signed her residence as Fremont, Michigan, in 1890, I don't know. Perhaps a reader can shed some light. Johanna or Hanna Welink was born in 1884 in Michigan, the daughter of Garret J. Welink and his wife Catharine (Huffenruiter) Welink. According to the 1900 Census, Garret J. Welink was born about 1852 in Germany, and Catherine was born about 1846 in Holland. 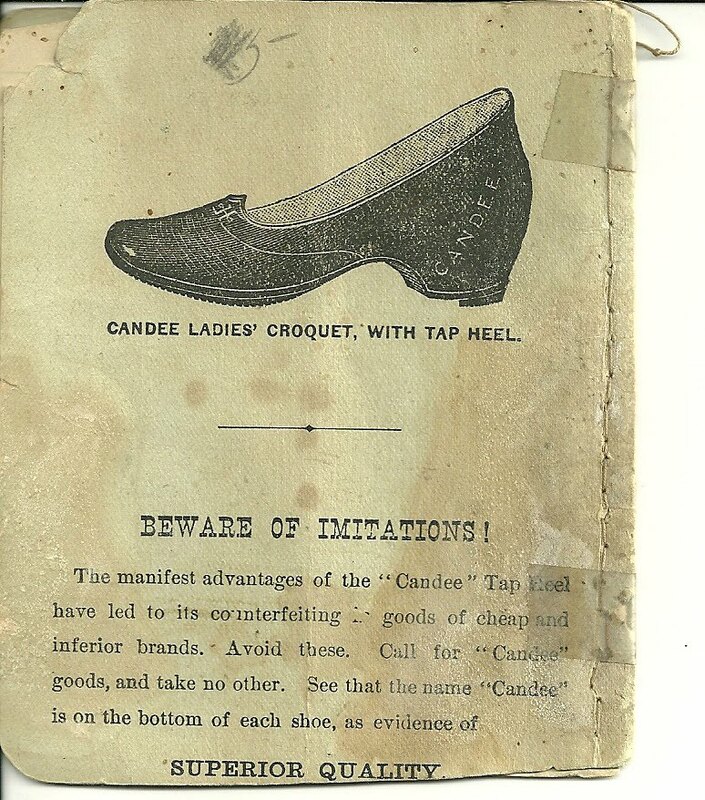 They came to the United States in 1883, with Grace and Henry John, who were born in Germany. Johanna married Edwin Bierce, the son of Alonzo and Salome Bierce of Michigan. I couldn't find a record of any children from the marriage. Hopefully you have found this heirloom meaningful. If you have any information on the Welink family, I would love to hear from you.